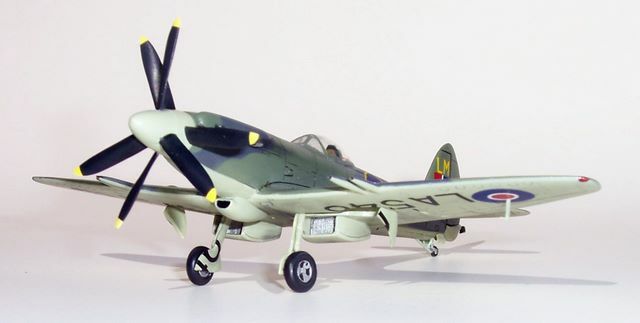 The Seafire F.46 was the penultimate member of the Spitfire/Seafire family (if you don’t count the Spiteful and Seafang), and was a post-war aircraft used in limited numbers. Essentially it was a navalised version of the Spitfire Mk 22 with a contra-rotating 6-blade prop. They survived in service due in part to the cautious adoption of jet aircraft for carrier use, and the consequent lack of jet-powered alternative ship-borne fighters in the late forties and early fifties. The late model Spitfires and Seafires are said by some to no longer resemble “true” Spitfires following their adoption of the new wing introduced with the Spitfire Mk 21 and the larger tail surfaces introduced with the Mk 22. Certainly this view has been expressed amongst a group of my modelling mates as we build various members of the Spitfire/Seafire family as our group build project for 2007. I can understand this point of view to some extent, although it’s hardly of any academic importance. Personally, and purely from an aesthetics point of view, I’m not a fan of the Mk 21. I do think that the Spitfire 22 & 24 and Seafire 46 & 47 are truly handsome aircraft in their own right, however much their appearance may have changed from their earlier brethren. 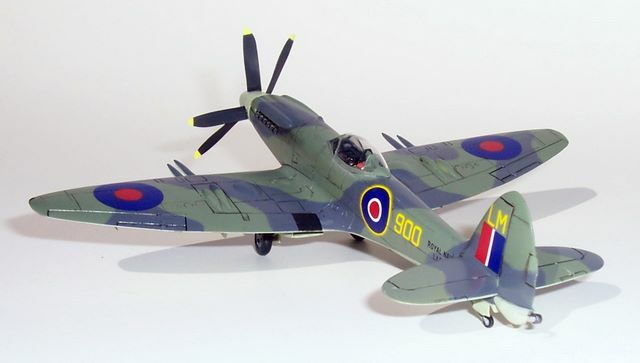 Czech Master Resin (CMR) produces the largest and most comprehensive range of 1:72 Spitfire and Seafire kits, and continues to add to it. 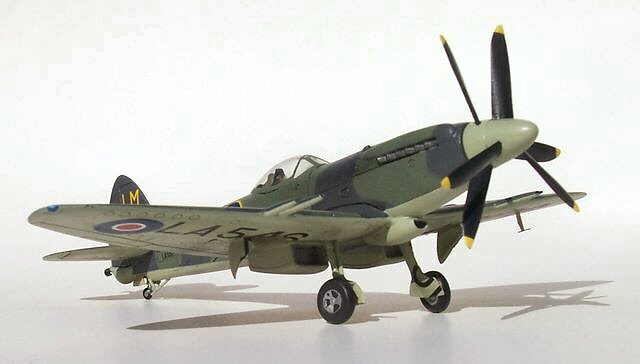 The Seafire F.46 is typical of the range, being crisply moulded with delicate detail and straightforward construction. The wheel wells deserve special mention for their depth and very realistic internal wheel bulge in the upper wing’s surface. The kit offers three markings options, and clear instructions, plus two vac-from canopies. There is not a lot to report regarding kit construction because it is so simple and problem free. The fit of parts is essentially comparable to a good injected kit (but of course without locating tabs). Very little cleaning up of parts is needed, and the castings are virtually pin-hole free other than a couple on the wing leading edge where the casting block attaches. These were easily fixed in a matter of minutes with super glue and a quick sanding. Consequently assembly was very quick, and any very slight gaps were catered for with Mr Surfacer. All that was needed to tidy this up was a cotton bud soaked in acetone to wipe away any excess Mr Surfacer (the great thing about resin being its resistance to most organic solvents). Before I knew it I was ready to paint. Prior to assembly, and aside from painting the cockpit, I also painted the radiator/intercooler matrices before masking them and installing them in their underwing housings. I do this with all Spitfire and Seafire models as I am then free to spray the under-surfaces and radiator housing interiors, needing only a sharp blade and tweezers to lift the masking tape. Camouflage masking was achieved with blue-tac and I used Xtracolour paints. I was struck by some photos of Seafire F.46’s that whilst their upper surfaces were clean and un-worn that their under-surfaces could be incredibly dirty and oil-stained, so my model tries to reflect this pattern of weathering. All in all this was a simple and most enjoyable build of a very aggressive yet graceful looking aircraft. I think it would be a suitable subject for anyone with only one or two resin builds under their belt, or a first-time resin builder with confidence. 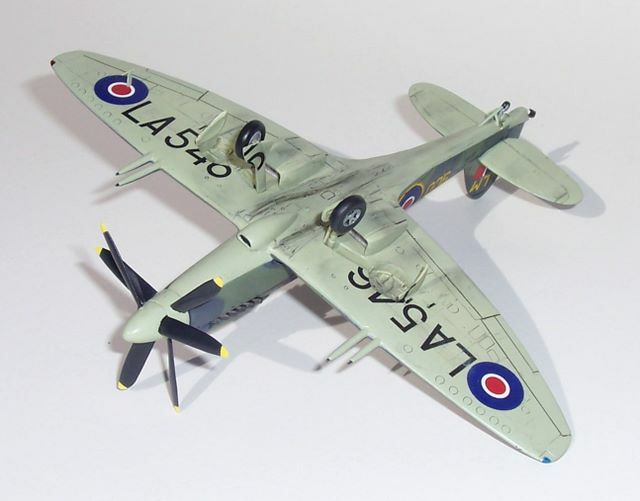 From any way you look at it, CMR’s F.46 makes for an interesting and attractive addition to the modelling cabinet.